Majestically standing atop a hill, Deogarh Mahal is an imposing palace boasting a commanding view of the Aravalli mountain range, lakes, and countryside. With its gray battlements, domes, turrets, jharokhas, and huge gateways, Deogarh Mahal is a stunning sight from the the village below. Originally built in 1670, the palace was constructed as a personal residence and fort after a long history of turmoil and sovereign disorder between aristocratic members of the Mewar region. 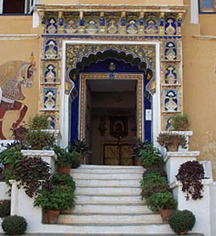 From the beginning, Deogarh Mahal has been a cultural hub for village activity and has remained an integral ambassador of economy and heritage of the Mewar region. Boasting 50 individually decorated guestrooms and suites, Deogarh Mahal highlights the rich history, art, and traditions of India throughout the property with expressive colors, vibrant linens, and intricately detailed furnishings. The spacious palace emphasizes its opulence through refined Indian and international cuisine made with local flavors and ingredients, luxurious amenities, including a swimming pool, fitness center, and library. While less ostentatious than other Rajasthan residences, Deogarh Mahal represents a wealth of history and cultural significance appropriately recognizing the centuries of adversity and perseverance the Mewar nobility endured to establish this great palace. 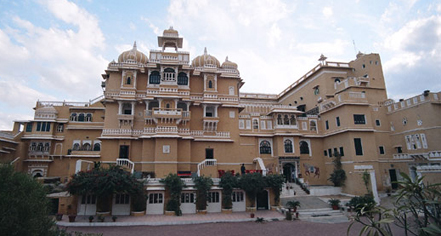 Deogarh Mahal, a charter member of Historic Hotels Worldwide since 2012, dates back to 1670. Each part of the Doegarh Mahal tells a story. For example, the gateway into the front courtyard passes beneath the “Kacheri” where justice was administered – reminding us immediately that the Deograh rulers held powers of life and limb over their subjects. Extra Person Fees: One additional older child or adult is charged INR 1500 per person per night in an extra bed. Parking: On-site parking: Available. Valet parking: Available. Learn more about the History of Deogarh Mahal .